WASHINGTON (CNN) – In a dramatic escalation of the rhetoric over President Obama's controversial tax cut deal, senior White House economic adviser Larry Summers warned Congress on Wednesday that failing to pass the legislation could lead to a double-dip recession in 2011. "If they don't pass this bill in the next couple weeks it will materially increase the risk that the economy would stall out and we would have a double dip," he told reporters at a White House briefing. 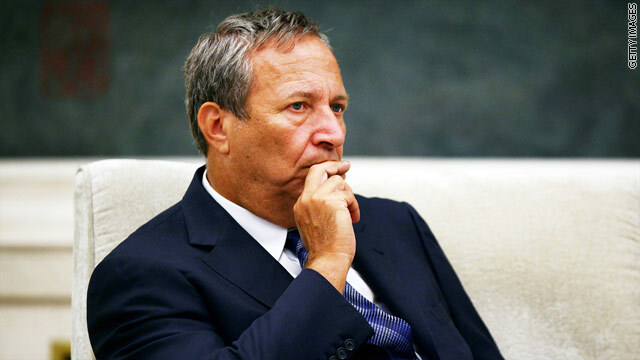 Pressed for clarification given the dire nature of his statement, Summers stressed that he was only saying it would "significantly increase the risk" of that outcome and was not predicting an actual double dip recession, which is defined as a recession followed by a short-lived recovery and then another recession. While some economists feared the possibility of a double dip recession for parts of 2009, White House aides have said for months that the possibility of such an outcome was remote. Summers' statement seemed to be a clear attempt by White House officials to raise the stakes in the tax cut fight, with senior White House adviser David Axelrod adding at the same briefing that "there are real consequences" for the American people if Congress fails to approve the package, which includes a two-year extension of all the Bush tax rates as well as 13 months of unemployment benefits and a two percentage point cut in the payroll tax. Summers also warned that failure to pass the bill could reverse the positive predictions for the economy that various analysts like Mark Zandi of Moody's Analytics have offered since Obama's announcement of the tax deal. Echoing the views of other analysts at Goldman Sachs and elsewhere, Zandi now says that real Gross Domestic Product growth in 2011 "will accelerate to four percent, job gains will pick up to 2.8 million, and the unemployment rate will decline to around 8.5 percent by year's end." However, Summers said that a "set of downward revisions would commence" on Wall Street if the tax package doesn't pass by the end of the year. Also raising the stakes in the tax fight, White House Press Secretary Robert Gibbs for the first time held open the possibility of Obama heading to Capitol Hill at some point in the waning days of the lame duck session of Congress to personally lobby wavering lawmakers on the matter. Gibbs noted that Vice President Joe Biden and other administration officials will be on Capitol Hill Wednesday evening for the second straight day lobbying lawmakers and "that doesn't preclude at some point" the president heading to Congress as well for a dramatic personal appeal. The comments came just hours after Obama himself downplayed tensions among Democrats and told reporters he expects the deal will pass in the end. "I think it is inaccurate to characterize Democrats at large as feeling, quote unquote, 'betrayed,'" Obama said. "I think Democrats are looking at this bill and you've already had a whole bunch of 'em who've said, this makes sense and I think the more they look at it the more of them are going to say this makes sense." Obama said he is confident that after lawmakers "examine it carefully" they will see this is the right course to ensure a healthy economic recovery. "You've just had economists over the last 24, 48 hours examine this and say this is going to boost the economy, it is going to grow the economy, it is going to increase the likelihood that we can drive down the unemployment rate," said Obama. "And it's going to make sure that 2 million people who stand to lose unemployment insurance at the end of this month get it; that folks who count on college tax credits or child tax credits or the Earned Income Tax Credit, that they're getting relief; and that tens of millions of Americans are not going to see their paychecks shrink come January 1st."